So tell us, Juliet, what’s in your TBR pile? 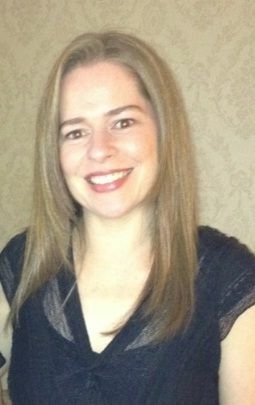 Thanks Kerrie for inviting me to your blog today! Well it seems I’ve been doing more writing and blogging lately than reading, but still, I’ve always got a book on the go, sometimes more than one. I recently got a Kindle too, so now there is even more temptation to buy books because ebooks are so cheap and there are many novels only being published digitally that I want to read. So, my To Be Read pile is a combination of print books in a bookcase and digital files stored nice and neatly in my Kindle. At least the latter don’t fall over or get warped from being squished because there’s not enough room in the bookcase! I’ve just read The Violet’s of March by Sarah Jio, an intriguing, romantic novel that tugs on the heart strings. It merges events from the 1940’s to the present day through an old diary the main character discovers while staying with her aunt on Bainbridge Island. It’s an absorbing read and the setting was nice and atmospheric, and it had interesting characters of different ages. The diary entries are just as interesting as the main story, and I found it easy to get carried away with them and what had happened to this woman in the 40’s. It seems to be a mixture of romance, women’s fiction, and mystery, and I’d be interested to read more from Sarah. I’ve also just done some critiquing on my critique partner’s manuscript, and let me tell you – I can’t wait till a publisher snaps it up! It’s a fantastic, intriguing (I like that word), and romantic story revolving around the passion of the tango world, and spanning three generations of women and how their lives and relationships have been affected by the dance of love. 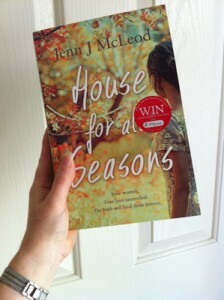 I’m just about to start Jenn J McLeod’s debut novel, House For All Seasons which I was lucky enough to receive an advance copy of, and I’m really looking forward to it. The story premise has me hooked already, I love Jenn’s writing (having read some samples and her short stories over the past few years), and the cover just draws me in. I will be trying to have a few early nights in order to indulge in this book! I’ve also been reading a writing craft book called 2k to 10k, which will hopefully have me upping my daily word count and getting all my books written faster! I cannot possibly list all the books I want to read, or poor Kerrie’s blog will go on and on and on! But I’ll share a few books I’m looking forward to reading soon. For Christmas I received Lisa Genova’s Love Anthony, which sounds like a book I’ll be needing the tissues for, especially as the story revolves around something close to my heart – autism. I also have my fellow Escape Artist (author from Escape Publishing), Alissa Callen’s book, What Love Sounds Like loaded on my Kindle and have snuck in a quick read of the first few pages and am looking forward to getting stuck into that one. Rachael John’s new book Man Drought is also high on my list, as is The Meryl Streep Movie Club by Mia March. But before I go, I’d like to hear what you’re reading at the moment. Leave a comment to go in the draw for a $50 Amazon gift card or the runner up prize of a $25 gift card. Comment on other blogs during my February blog tour in celebration of my debut release, FAST FORWARD, for more entries into the draw! Winners drawn 1st March. You can also win a bonus $25 gift card by purchasing FAST FORWARD and emailing your receipt to fastforwardbook (at) gmail (dot) com. Thanks for being on my blog – you’ve given me even more to add to my own TBR list – and all the best with Fast Forward! Absolutely LOVE this idea!! And I share a lot of your titles. Thanks for the MAN DROUGHT mention, I hope you enjoy it!!! All these terrible coenequnsces of blogging 😉 In the beginning I enjoyed my growing TBR a lot, but I found that once I had more than 50 books to choose among, it was difficult for me to make up my mind which one to read. So now I am trying to regain the control of my books. I have been VERY GOOD for two months, but let s see. Love this idea, only thing it would be is that some books may not be available for UK. Do you think your TBR pile increased exponentially when you got a Kindle? I think mine did – and it was large enough beforehand! Glad to know I’m not the only one with piles of reading to do! Good luck with Fast Forward, Juliet. Thanks Cate, and yep – now I have TWO TBR piles!! I’ve read both Annie Seaton’s steampunk novels lately: Winter of the Passion Flower & Summer of the Moon Flower. (I hope I’ve got my flowers and seasons right). Jenn J’s House For All Seasons is on my list too. I’m going to buy that for my Mum’s birthday in March and read it after her. And I finished hard copy of Man Drought not long ago. Cate Ellink – I agree that since I had my kindle, my TBR list has grown, but I’m having some technical trouble with the downloads right now with the move interstate. Need to change some wireless settings I think. Cheers Kerrie & Juliet, thanks for the post. Thanks for stopping by, Lily, and I’m sure your upcoming book will be added to lots of TBR piles soon! Great idea for a post Kerrie and thank you Juliet for making me feel so guilty about my shambolic TBR pile that I am rushing off to build a new bookcase! I’m looking forward to Jenn’s book too. If I buy any more (physical) books I think I’ll need a new bookcase! Congratulations on your first *live Blog Interview* Kerrie and thank you for sharing your reads with us Juliet. Thanks for being my first guest poster Juliet! You’ve given us all lots of ideas to add to our own TBR list! Crikey! What a list. But there re some beauties on there that I have loved nd am yet to read. I must sy, you have excellent taste in novels!!!!! Thanks Shannon, there are so many great books to read! In print, I’m reading Charlotte Druckman’s SKIRT STEAK, about female chefs. For Kindle, I’m reading Lily Harlem’s HIRED (hockey romance!) and Abigail Roux’s m/m THE GRAVEDIGGER’S BRAWL. Great list of books. I have read a few of them, Jillaroo, Mandrought, Holiday Affair. etc. I’m looking forward to A House for all Seasons. Fantastic first interview, Kerrie and Juliet. I now have a longer list of books to read and as I love a good laugh, yours will be in there, Juliet. Some fabulous books there Juliet on your TBR pile. I actually noted a couple down for myself, not that I need anymore books. 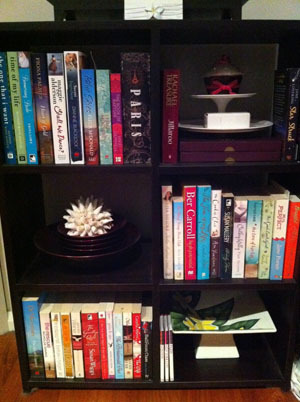 Then I looked at your tidy bookcase pic & compared it to mine & thought OMG, I need to organise myself. Great post & I’m sorry to say your book is still on my TBR pile but Im looking forward to reading it. All the best on your blog hop too. Cecilia Ahern’s The Time of My Life was an awesome read. And I enjoyed Boomerang Bride both on Kindle and in print. Loved Fast Forward and would highly recommend it as a great read!